I have been referred to as "persistent with clear notions." I must admit that is probably a fair assessment. Here is an example of why someone might draw that conclusion. 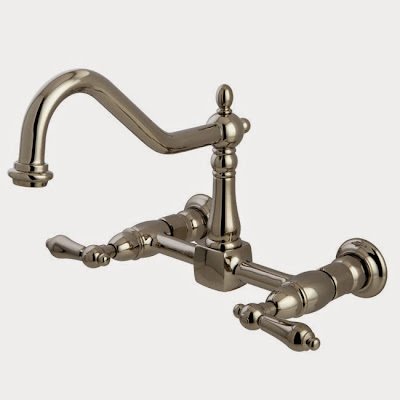 On the day we started the kitchen project I published a post about what I was looking for in a faucet. At that time I had not found anything that really spoke to me. About one month later I saw this and knew it was the one for me. There was one caveat. Below the words: Ships in seven days were the words, BACK ORDERED. I decided I better speak to someone about the length of the delay. Turns out that would depend on who I talked to. The first person said it meant seven days because normal shipping would be immediate. I called again and found someone willing to call the manufacturer. I later received an email telling me it would be 90 days. I pondered that for awhile but when I could not find one I liked as well, I decided to endure the wait. However, when I tried to place my order, that faucet was only available in oil rubbed bronze, polished brass, and chrome. Of course I wanted the satin nickel that was now DISCONTINUED!!! This prompted a frenzy of searching every company on line that carried faucets and checking every local retailer in the hopes they might have one in stock. Turns out the big box stores don't stock wall mount faucets. In desperation I emailed the manufacturer directly. I received an email back saying: Due to production delays, this product would not be available for 90 days. Phew! Not discontinued, only delayed. No sense rushing to order now, so I let some time pass. And then it occurred to me that I could wait the 90 days only to be told that whatever was causing production delay could not be fixed. I made one last ditch effort. I sent another email to Erik at Kingston Brass pleading with him to check the shelves to see if just maybe there was ONE faucet hiding somewhere on the premises. When after a few days I had not heard back, I felt I had to find another faucet I could live with. 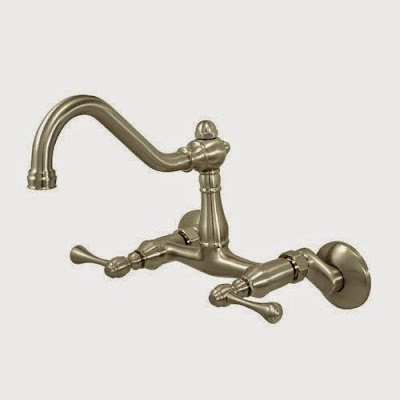 I searched so many sites that I was being bombarded with multiple ads for faucets. 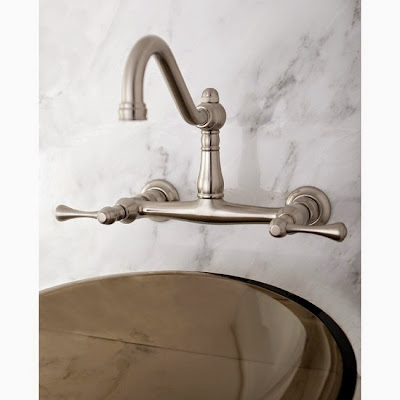 I debated the pros and cons...OK the cons, of every other wall mounted faucet I found. I even considered ordering the faucet I really liked in another finish, but I just could not bring myself to do that. If I couldn't have the twin I wanted, I was not going to take his brother. I looked at this one but I didn't like the short bar between handles and the adjustable spread that allowed the connections to be anywhere from a 3 1/2 to an 8 inch spread. Although I didn't like the cube below the spout on this one nor the shape of the levers, I decided I would have to order something and this might just have to be it. So after three weeks of trying to get the faucet I wanted, I caved and convinced myself this one would be just fine. I ordered it and shut down the computer with a sigh of relief that a decision had been made. Fortunately the next on-line company* I tried was perfectly willing to handle the transaction. I ordered my beautiful wall mounted faucet, and then emailed Erik with PO# and he emailed a response that he had received it and would match it to my order. Kudos to Kingston Brass for good communication, and a round of applause for going the extra mile to accommodate a customer. *First company was Build.com. Second company was FaucetDiect.com. Turns out this is really one company with two on-line addresses. Guess the difference is in who answers the phone. Lesson being: If you don't get the answer you want the first time, call back. Maybe someone more accommodating will answer the phone. I felt confident I could now relax and wait for my faucet to arrive. One week passed and then the holiday weekend. On Tues. the counter top company called to remind me I needed to have the faucet on site by Friday when they would be delivering the tops and they would need to drill the faucet holes. I thought it might be good to check the shipping status with Erik. I pushed send and a couple minutes later there was an email from Faucet Direct saying they had cancelled my order since that faucet was no longer available. PANIC mode! I forwarded the cancellation notice to Erik and put in a call to Ashley at Faucet Direct. Ashley emailed back that she was working with her supervisor to solve the problem. The next morning I had an email from Erik saying he would be shipping the faucet that day. I started to feel some relief but the phrase, "Don't hold your breath," came to mind. Then I get an email from Faucet Direct saying that the amount of my purchase was being refunded to my credit card. I also received an email from Hilary, the supervisor at Build.com, saying she was sorry they could not fill my order due to the fact that it was discontinued by the manufacturer. At this point I am depending on my contact at Kingston Brass to come through despite all the push-back from the dealer. Now things really turn into a three ring circus. Suddenly I am getting emails from Jessica at Kingston Brass and Hilary at Build.com. each wanting to be forwarded the emails from the other. I have 29 emails in my inbox and did not count the ones I sent. Somewhere in there someone turned things over to Dylan but as of yet I have not heard from him. I am still trying to funnel everything through Ashley because she was in on it from the beginning. She is, however, working from home on this particular day. Forwarded emails are crisscrossing the country and even I am losing track of who was holding the ball. It reminds me of looking under a desk where all the black cords are tangled together and it is impossible to see what is connected to what. The last I heard from Ashley is that she wanted me to reorder the faucet because my order had been cancelled and we needed to start from the beginning. I did as she asked. The funny part is I received a tracking number from Kingston Brass early in the morning before all the email madness started. Then emails stopped as everyone left for the day. I was still wondering what had really happened over the last 10 hours when I get another email from Build.com telling me my order is scheduled to ship on Sept. 4th!!! OMG (I just checked the tracking number and it has left Ontario, CA.) Where it is headed...well, that's still a mystery. Nothing to do but go to bed because my counter tops were scheduled to arrive at 7 a.m. The truck arrived on time this morning. This is the one part I now have installed. The backsplash and window sill were not ready so another date will be set for those to be installed. The tops for either side of the range had to be taken back to the shop as someone missed the directions to radius the back corner. The good news is the flush reveal between sink and counter top turned out great. Because of the shadow it is not apparent in this photo, but it does look good.